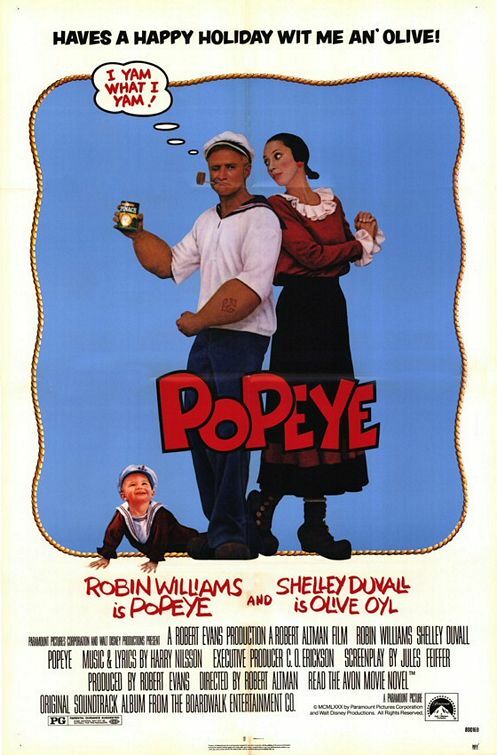 A squinty sailor (Robin Williams) searching for his long-lost father (Ray Walston) arrives in a seaside town called Sweet Haven, where he falls in love with quirky Olive Oyl (Shelly Duvall) and, with Olive, becomes the father of a foundling named Swee’ Pea (Wesley Ivan Hurt). Robert Altman’s Popeye continues to be viewed by many as merely another ill-conceived failure in the infamously checkered yet estimable career of this iconoclastic director. Altman’s attempt to bring E.C. Segar’s beloved comic strip (or, more accurately, Fleischer Studios’ animated shorts from the 1930s-50s) to the big screen as a musical-comedy — complete with his characteristic ensemble cast and overlapping dialogue — seems like an odd venture to be sure, and isn’t entirely successful. 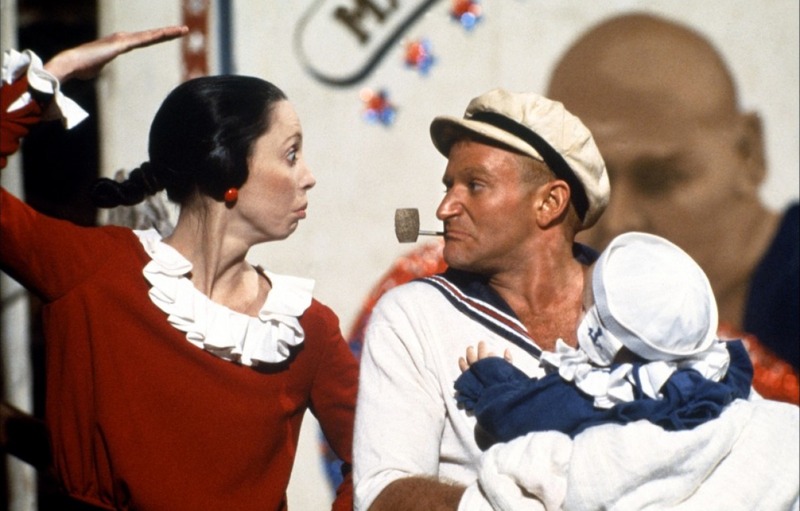 But it’s redeemed at least in part by a casting choice made in heaven: Shelley Duvall as spindly-legged Olive Oyl. Duvall brings Olive’s comic presence to full-blooded life, craning her neck and stumbling across the sets with a physical dexterity and verisimilitude one can only marvel at; she emerges as the most fully realized character in the film. Meanwhile, Williams himself is fine and believable (if oddly restrained) in the title role, and other supporting actors — including Altman’s own grandson as Swee’ Pea, and Paul Dooley as Wimpy — are nicely cast as well. Wolf Krueger’s production design is the second primary reason to check this film out. 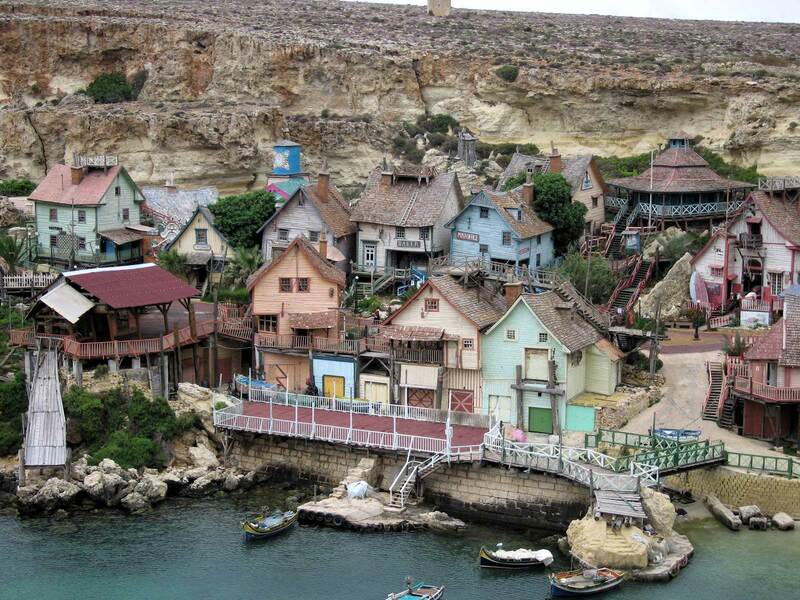 Built on the island of Malta (and apparently still in existence as a significant tourist attraction), the set is a sight to behold, effectively portraying Sweet Haven as a quirky, ramshackle alter-universe. Where the film stumbles, ironically, is in its faithfulness to its comic origins. While there’s something undeniably tickling about seeing these 2-D characters made manifest (at least for fans of the original Fleischer shorts, like myself), the storyline — including a kidnapping of Swee’ Pea by Bluto (Paul L. Smith), and Popeye’s weird reconciliation with his absentee father — eventually devolves into too much slapstick for its own good. Meanwhile, the songs (all written by Harry Nilsson) are decidedly hit-or-miss, with a number of them instantly forgettable. However, when Olive sings one of the more memorable tunes — “He’s Large” — in defense of her choice in beaus, and repeatedly states, “He may not be the best/But he’s large/And he’s mine”, one simply can’t help giggling. No, but I think most Altman fans will be curious to check it out. Listed as a Sleeper in the back of Peary’s book. Not a must. I tend to agree that it is a sleeper – in a more literal sense. I saw this on release and, having seen it again, my opinion hasn’t changed in the least. For me, Altman can go from great to watchable to misguided. ‘Popeye’ goes in the latter group. Duvall is more than fine, Williams is somewhat effective (and not showy, always a plus with him) but, alas, neither can save the film or make it worth recommending. The rest of the cast (including some normally wonderful character actors) seem quite game for the project but simultaneously befuddled. Altman was either the wrong director – or it’s possible that the characters simply weren’t crying out for the big-screen transition.